Abdullah (transliteration: ʿAbdullāh, Arabic: عبد الله) is an Arabic name for God that means “servant of God”. The name is made up of the words ʿabd (“servant”, “slave”)1 and the Arabic word for God (Allah). 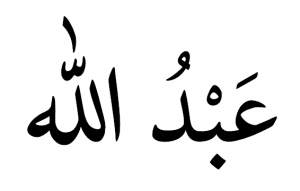 Due to the way the Arabic language works, when pronouncing the name ʿabd Allah becomes ʿabdullah. The name Abdullah is also spelled as Abdallah, Abdellah, Abd Allah, Abdollah, Abdola and Abdella, among others. He said, “I am the servant of God. He has given me the Scripture, and made me a prophet. And when the servant of God got up calling on Him, they almost fell on him in a mass. Abdullah was one of the most common Arabian names both before and after the coming of Islam. The father of Prophet Muhammad was named Abdullah. The Prophet also had 699 Companions by the name of Abdullah. Their full names are listed at the bottom of this article.